I specialise in pinball games from the 1940s to present. With over 35 years experience. arcade mechanical gun games,Bingo Machines, Jukeboxes (excluding Seeburg and CD) and other similar arcade games. This includes coin operated games made by Gottlieb, Williams, Bally, DataEast, Midway, Sega, Stern, Chicago Coin,Playmatic, Sonic & others. Newer Solidstate dot matrix display games to the oldest electro-mechanical pinballs. I can service your machine at your place including outside of Auckland or in my workshop if needed. In many cases I can repair and return Electronic circuit boards by post to any part of New Zealand, as I have various test fixtures and have no need for the entire machine in many cases. 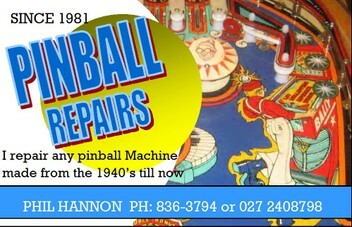 Fantastic guy to deal with on Pinball Machine repairs. Highly recommended. Unquestionably the go to guy for repairs of pinballs and amusement machines. Very knowledgeable and helpful. Excellent value. Very knowledgeable, friendly and efficient in pinball machine service & repair. Highly recommended. AA+++++. Excellent service. Arrived on time diagnosed the many faults fixed quickly. Personable manner. Highly recommended.